Home » Famous Paris Fashion Designers in 1916. Famous Paris Fashion Designers. French Couturiers in 1916. Beer — Place Vendome — Noted as the handsomest quarters of any of the Paris dressmakers. An atmosphere of great refinement surrounds all Beer models. Bernard — Avenue de l’Opera — This house caters very extensively to the American trade and sells the majority of its models to garment manufacturers in the United States. It enjoys great success with tailored suits, separate coats and furs. Costumes by Beer. Bulloz — rue Royale — One of the younger and yet a most successful dressmaker. Mr. Bulloz was for many years the head designer for Beer, of the Place Vendome. He does all of his own designing and is known as a man of exquisite taste and fertility of ideas. Callot Soeurs (Sisters) — Avenue Matignon near the Palace Elysée, official home of the President of France — Firm owned and operated by four sisters, Marie Callot Gerber, Marthe Callot Bertrand, Regina Callot Tennyson-Chantrell and Joséphine Callot Crimont, between 50 and 60 years of age. Caters largely to theatrical and operatic custom. Costumes by Callot Soeurs. Cheruit — 21 Place Vendome — Built up under the personal direction of Madame Cheruit. 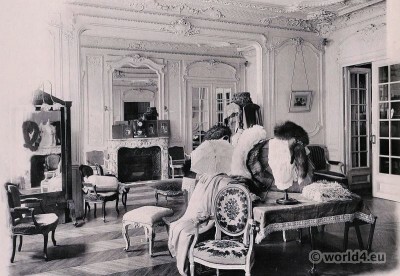 The business just prior to the war was sold to Mesdames Woermser and Boulanger, who conduct it under the name of Cheruit; though Madame Cheruit is no longer active. Costumes by Madeleine Chéruit. Doeuillet — Place Vendome — One of the most personally conducted dressmaking establishments in Paris, the entire direction being in the hands of Monsieur Doeuillet himself. This house has a fine following among the elite and is also very popular with American importing firms. Costumes by Georges Dœuillet. Doucet — Rue de la Paix, not far from Paquin`s — Doucet customers are mostly private people and include great numbers of fashionable women. The founder of the House of Doucet started business as a shirt-maker and haberdasher. He was the first ladies’ tailor in Paris. This house also furnishes costumes to many of the big theaters and is noted for its classic styles. Drecoll — Place de ľOpera — Original house in Vienna. Paris house now owned by Swiss and English capitalists. Very successful and of high standing. At present under English management. Costumes by Drecoll. Jeanne Lanvin — Faubourg St. Honore — Madame Jeanne Lanvin was formerly a successful milliner, but for the past few years has come to the front as a producer of successful models that are of the type referred to as “little dresses” — frocks of simple and girlish and becoming lines. The Lanvin dress is always marked by some original touch. Costumes by Jeanne Lanvin. Jenny — 70 Avenue des Champs Elysées — Very well known and popular firm of recent organization, as compared with other firms. Madame Jenny gives personal attention to the designing and her husband is the business manager. This house has a great following both in Paris and with American buyers. Noted for simple, youthful styles. Costumes by Jenny. Martial et Armand — Place Vendome — The Martial et Armand quarters are among the handsomest in Paris, occupying a palatial residence in which dwelt, at one time, various Ministers of State during the reigns of Louis XIV and XV. Besides the large and successful dressmaking business the Martial et Armand shop also makes a specialty of trousseaux and children’s wear. Costumes by Martial et Armand. Paquin — Rue de la Paix, near Place Vendome — English company with Sir John Barker, of the Barker Stores, London, president of the organization. Very high class establishment. Managed by Madame Paquin herself since the death of her husband. Costumes by Jeanne Paquin. Paul Poiret — Avenue d’Antin — Noted for his extreme and sometimes eccentric dress conceptions; daring in color scheme as well as design. Inactive since the war. 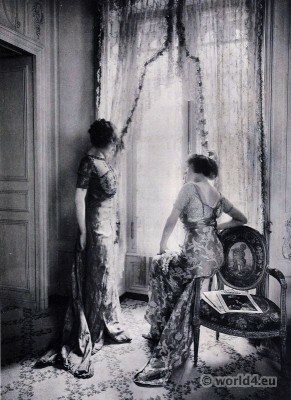 Costumes by Paul Poiret. Redfern — rue de Rivoli, facing the Gardens of Tuilleries — Through one of the leading concerns of Paris this firm is wholly English in its character. Their creations are somewhat influenced by eccentric or ephemeral fashion developments. This house is celebrated for the use of rich materials in exclusive patterns. Costumes by Redfern. Worth — 7 rue de la Paix — Well-known English house of practically three generations’ standing. Founder was the dressmaker for Queen Victoria and other royal women of her period. Business now operated under direction of second and third generations. House noted for dignified and sumptuous style of dress. This firm makes more court presentation gowns than any other in Paris. Costumes by Charles Frederick Worth.